One of my favourite things about fall is fresh apples. I usually buy a 10 pound bag of MacIntoshes from Costco – a great deal at $10 – and gorge myself on apple recipes so I can use them up before they go bad. I buy Macs because they’re a great all-purpose apple. They’re tasty to eat fresh but also fare well in baked and cooked recipes. 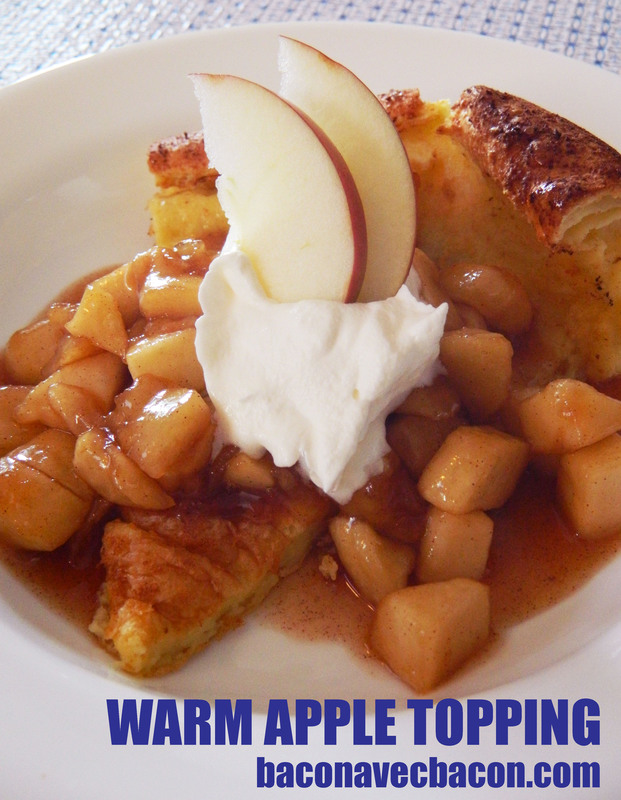 Today’s recipe is for a warm apple pie style topping. 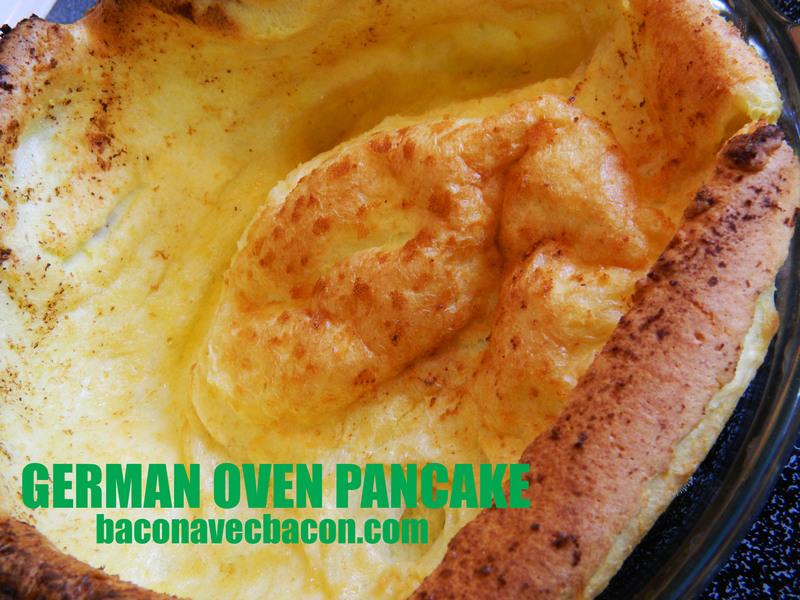 I had mine on a fluffy German oven pancake (or ‘Dutch Baby’) but but this topping would be equally at home on regular pancakes, waffles, oatmeal or even ice cream. If you’re looking for a ‘quick’ pancake option, try Krusteaz brand pancake mix. Even though it’s a ‘just add water’ mix, they are literally the best pancakes I’ve ever had outside of a restaurant. In Canada, the mix is only available in a giant bag from Costco but it’s readily available in other formats in the US. 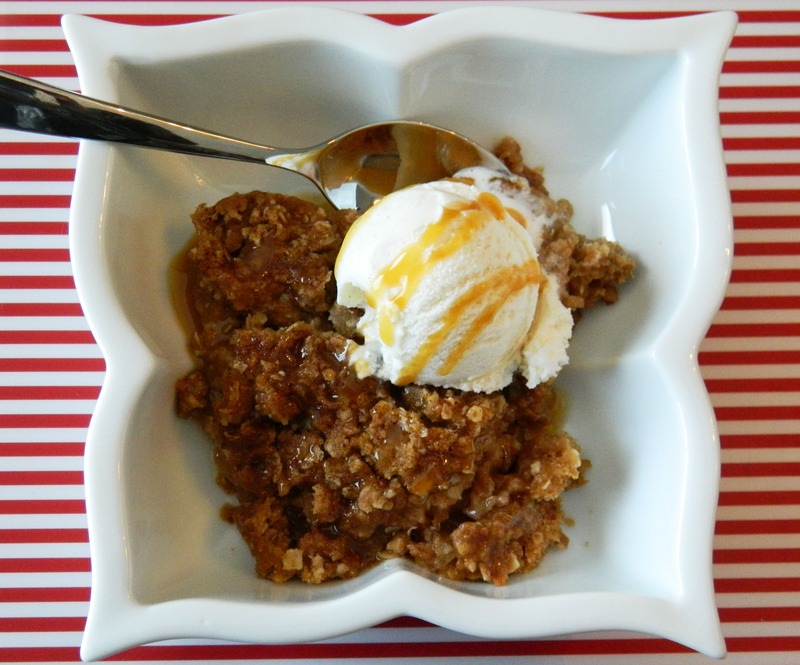 In a small pot over medium heat, mix together the cornstarch and the brown sugar. Add all of the ingredients except for the butter and stir to combine. Bring to a boil and let boil for at least a minute then reduce heat and simmer until apples are tender (about 8 minutes). Add the butter at the very end and stir to combine. Preheat your oven to 450 degrees. Place the butter in the bottom of a glass pie plate and let it get sizzling hot. In the meantime, in a large bowl, beat together the eggs, milk, flour and salt until smooth. When the butter is sizzling, pour the mix into the pie plate and bake for 15 minutes. Reduce the heat to 350 and bake for an additional 10 minutes or until brown. Make sure to keep an eye out as it never seems to take the full 10 minutes.